Inspired by the client’s desire for entertainment spaces, the intention behind this design was to create a social hub while maintaining a degree of privacy in particular areas. The marriage of a large outdoor entertaining balcony and an expansive backyard provide ample space for gatherings and events while the pool demarcates the space. The indoor areas are predominantly open plan with bedrooms dispersed away from entertainment areas to allow privacy. 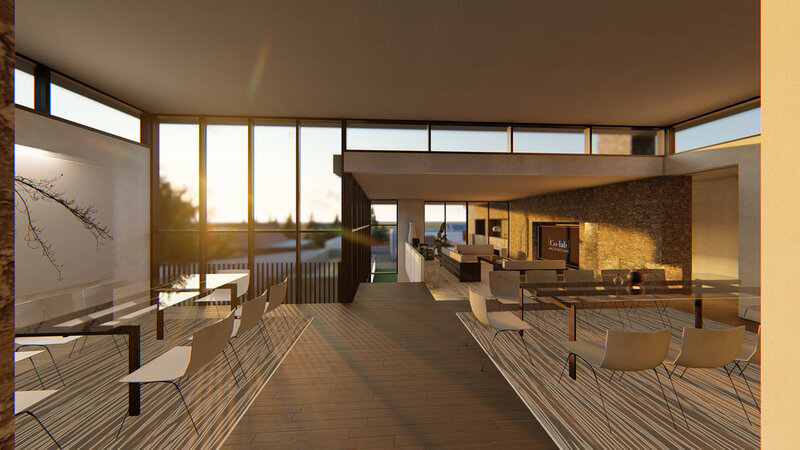 The unassuming entrance establishes an element of surprise by using a solid low front facade that immediately opens up into an open plan space with panoramic views into the outdoor space below. Visual continuity is achieved in the design through the long, low facade which appears embedded into the landscape as the structure merges with its surroundings. The sweeping roof planes protect outdoor spaces and complement the horizontality of the structure. Vertical timber cladding superimposed against the building contrasts both the form of the roof as well as the stone and concrete textures.